Oh my god please tell me this will be a print. It must adorn my new home. MUST. <3<3<3 Im swooning over the MOTHRAAAAAAA. Haha glad you like it! There won't be a print, no. I can't do copyrighted characters! Oh derp me, I KNEW THAT. My brain is tired, and my dreams are wired. 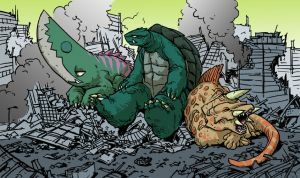 Just chillin...though Godzilla, dude, what's with the chewtoy? I. Am. So. In. Love. With. This!!!!!!!! I love this piece. Some of my favorites all together in a cute little monster pile. I especially like the various personalities they each have. Mothra and Gamera are like "Really dude, we're on vacation". Godzilla is all "Train, what train?" And Kong is thinking "Sigh, just ignore it, we go through this every vacation." Lots of great character in this. Each monster has a distinct vibe and personality. Your Mothra made me squee in an unmanly fashion. I approve. I need a shirt with this! Wow! This is so so amazing! Like no really this is really amazing! Keep goin alright? Keep making more! 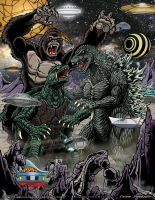 This is the Monsterverse I want!